Aggregations of organisms, ranging from zooplankton to whales, are an extremely common phenomenon in the pelagic zone; perhaps the best known are fish schools. Social aggregation is a special category that refers to groups that self-organize and maintain cohesion to exploit benefits such as protection from predators, and location and capture of resources more effectively and with greater energy efficiency than could a solitary individual. 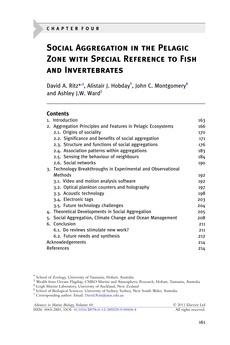 In this review we explore general aggregation principles, with specific reference to pelagic organisms; describe a range of new technologies either designed for studying aggregations or that could potentially be exploited for this purpose; report on the insights gained from theoretical modelling; discuss the relationship between social aggregation and ocean management; and speculate on the impact of climate change. Examples of aggregation occur in all animal phyla. Among pelagic organisms, it is possible that repeated co-occurrence of stable pairs of individuals, which has been established for some schooling fish, is the likely precursor leading to networks of social interaction and more complex social behaviour. Social network analysis has added new insights into social behaviour and allows us to dissect aggregations and to examine how the constituent individuals interact with each other. This type of analysis is well advanced in pinnipeds and cetaceans, and work on fish is progressing. Detailed three-dimensional analysis of schools has proved to be difficult, especially at sea, but there has been some progress recently. The technological aids for studying social aggregation include video and acoustics, and have benefited from advances in digitization, miniaturization, motion analysis and computing power. New techniques permit three-dimensional tracking of thousands of individual animals within a single group which has allowed novel insights to within-group interactions. Approaches using theoretical modelling of aggregations have a long history but only recently have hypotheses been tested empirically. The lack of synchrony between models and empirical data, and lack of a common framework to schooling models have hitherto hampered progress; however, recent developments in this field offer considerable promise. Further, we speculate that climate change, already having effects on ecosystems, could have dramatic effects on aggregations through its influence on species composition by altering distribution ranges, migration patterns, vertical migration, and oceanic acidity. Because most major commercial fishing targets schooling species, these changes could have important consequences for the dependent businesses.